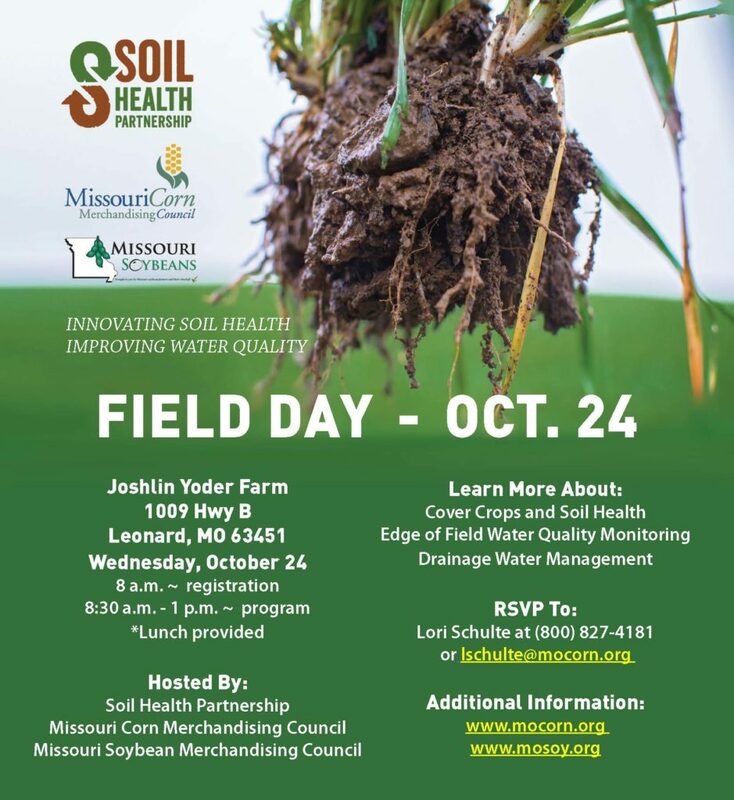 You are invited to join area farmers, industry partners and soil and water specialists for a field day October 24th at the Yoder farm near Leonard. This soil health and water quality focused event is being organized by the Soil Health Partnership and Missouri’s corn and soybean merchandising councils. This half-day event will include a science-based, hands-on look at cover crops, along with soil health, and drainage water management. Participants will also have the opportunity to learn more about Missouri’s effort to measure the water quality benefits of these practices using edge of field water monitoring. Abigail Peterson, NCGA Soil Health Partnership – What’s the Soil Health Partnership all about and how are growers becoming involved in Missouri? Darrick Steen, Missouri Corn and Missouri Soybean – Learn how Missouri Corn and Soybean Merchandising Council is measuring the water quality benefits of practices using edge of field water monitoring. Dr. Kelly Nelson, Research Agronomist University of Missouri Greenley Research Farm – Using Drainage Water Management and Recycling to boost production and water quality. David Doctorian, USDA-NRCS Soil Health Specialist – Demonstrating the NRCS Rainfall Simulator and explaining NRCS Cover Crop Cost-Share Programs. Matt Hill, MFA, Inc. and Natural Resources Conservation Specialist – Moderator of the Missouri Soil Health Partnership grower panel. Pre-registration for the field day is encouraged, as the event includes lunch and all materials. RSVP to Lori Schulte at (800) 827-4181. The Soil Health Partnership is a farmer-led initiative of the National Corn Growers Association, made possible in Missouri in-part through both the corn and soybean checkoff programs. The program’s goal is to quantify the benefits of practices like cover crops and reducing tillage from an economic standpoint, showing farmers how healthy soil benefits their bottom line. More than 110 private farms from 14 states are enrolled in the program. To learn more about the Soil Health Partnership, join us October 24 or explore soilhealthpartnership.org.